Toenail fungus is a condition that often goes unnoticed until it advances. You have to look out for the signs and symptoms of toenail fungus, one of which is the off-shade color of the nail. What color is toenail fungus? Nail coloration will depend on the type of fungus. Fungal toenails can turn white, which is typically the easiest to treat. But a discolored toenail due to fungus is most likely to turn yellow. As the condition worsens, the nail can turn a darker shade of yellow, brown or black. You may also notice the appearance of dark dots or speckles. This guide will identify the different colors of toenail fungus at various stages of the condition. We’ll start by explaining how to identify toenail fungus and what it means for the health of your toenails. It’s critically important that you treat the condition to remove toenail fungus permanently. 1.1 What Do Different Toenail Colors Mean? 2 What Can Cause Your Toenails to Change Color? Beginning stage. 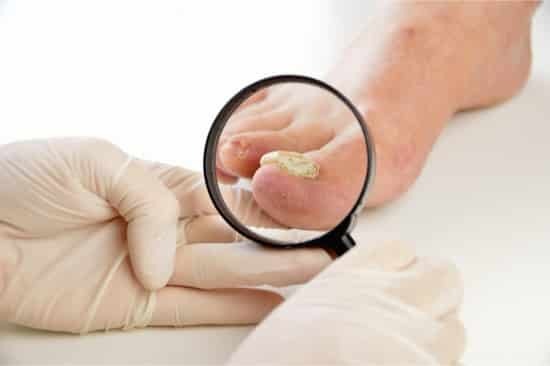 The only symptoms which may make it obvious that you have toenail fungus are the ‘cheesy’ smell, dark spots, off-color, and a slight thickening of the nail. Intermediate stage. The nail ranges from a pale yellow to a dull, but obvious yellow. This stage is often accompanied by brittleness, thickness, and an unpleasant odor. Advanced stage. The toenail color is deep yellow, or even brown or black. The nail will be crumbling away, misshapen, significantly thicker, and have a foul odor. It’s best to stop toenail fungus as soon as it arises. A fungal infection might become so bad that it’s challenging to clear up without oral medications. During the beginning stage, it only requires a couple of month’s regular treatment to clear up a fungal infection completely. Note that yellow toenails are not unique to toenail fungus. They are often associated with other conditions including infections, medical conditions, and environmental factors. What Do Different Toenail Colors Mean? Yellow nails and other nail colors too are a general sign of ill health. They are a marker for several different conditions, but it’s usually a fungal infection. This is the color of a nail infected by fungus. Before commencing treatment, you should file down the nail to allow the formula to reach the fungus more easily. Yellow toenails can also be a sign of diabetes or psoriasis. Yellow toenail syndrome (primary lymphedema) is a rare malformation of the nail. Blue nails indicate a lack of oxygen in the blood or poor circulation. You may benefit from a new diet, more exercise or a device to improve your blood flow, such as the Revitive Circulation Booster. It could also be a blue mole, called cellular blue nevus. Although very rare, it can be a sign of melanoma or cancer. This must be treated by a doctor as soon as possible. Pale nails can be a sign of illness, such as heart or liver failure. Dark lines or brown streaks (melanonychia) from the top to the bottom of the nail can be a sign of melanoma, inflammation, medication, injury, and fungus. If you haven’t recently banged your foot or experienced trauma, it needs to be investigated further. This can occur due to toenail fungus. Black nails are also a sign of recent bruising due to trauma (subungual hematoma). Perhaps you dropped something heavy on your nail that caused bruising. It’ll typically take up to 9 months for your new nail to grow through. Dark toenails can also be a sign that you have an ingrowing toenail or a form of cancer. If you haven’t dropped a heavy object on your foot or worn tight footwear, you should see a doctor. The toenails can turn white due to toenail fungus (white superficial onychomycosis). You’ll notice a white, powdery appearance. They can also occur when the nail is scratched somehow. White nails can be a sign of liver problems, like hepatitis. Green nail syndrome (chloronychia) gives your toenails a greenish tint. It is caused by bacteria (seudomonas aeruginosa), which are most commonly found in wet and damp environments. Wearing overly tight shoes could create an optimal environment. Pink nails are perfectly healthy. Nails that have changed color are a sure sign that something is wrong. This can range from something relatively serious like melanoma to something as simple as an infection. That’s why we call the nails the windows to our health. It’s also why you should speak with a doctor if your nails unexpectedly change color. Always inspect your feet and nails. What Can Cause Your Toenails to Change Color? Toenail discoloration can be linked to many conditions. Unfortunately, this is just as true for yellow toenails as any other color. It might be difficult to identify precisely what’s wrong. Excess nail polish can cause discoloration of the nails after removal. Once the polish is removed, the nail remains becomes yellow, no matter what color was applied. This is because the iron in some nail polish is absorbed by the nail. This turns it a yellow to light brown color. Smoking commonly turns the nails yellow. This isn’t because of an underlying condition. It is because the tobacco smoke comes into contact with your fingernails when you hold a cigarette. Your yellow nails may also be a sign of kidney disease. As a result of kidney disease, you may have more bilirubin in your blood than usual. Bilirubin is the part of bile that turns it yellow-brown. If your kidneys are not working correctly, they will not remove enough from the blood. With too much bilirubin in the blood, your nails will yellow. Yellow nails are a common sign of either thyroid disease or diabetes. This is not because of any additional infection. It’s because these conditions cause glucose to attach to the collagen in and underneath the nail. This turns them from their usual pink color to yellow. Other associated symptoms include fatigue, passing more water than usual, drinking more water than usual, and trouble losing weight. Yellow nails may also be a sign of lung disease, although this is rare. It is not associated with all kinds of lung disease. Nail psoriasis is a condition which affects the nails rather than the skin. Nail psoriasis typically affects the fingernails as opposed to the toenails, although any nail may be affected. This condition can cause similar symptoms to toenail fungus, such as the nail coming away from the bed. However, one of the signs of psoriasis is pitting of the nails, where the nail starts to look a little like a thimble, dotted with pits. Despite the prevalence of other conditions that cause yellow nails, fungal infection is still the most likely explanation. It is by far the most common reason why people get yellow nails. No matter what the underlying condition, the one thing you should know is that doing nothing about toenail fungus is not an option. That applies whether you have a fungal infection, or your yellowing toenails are a sign of a more concerning medical issue.